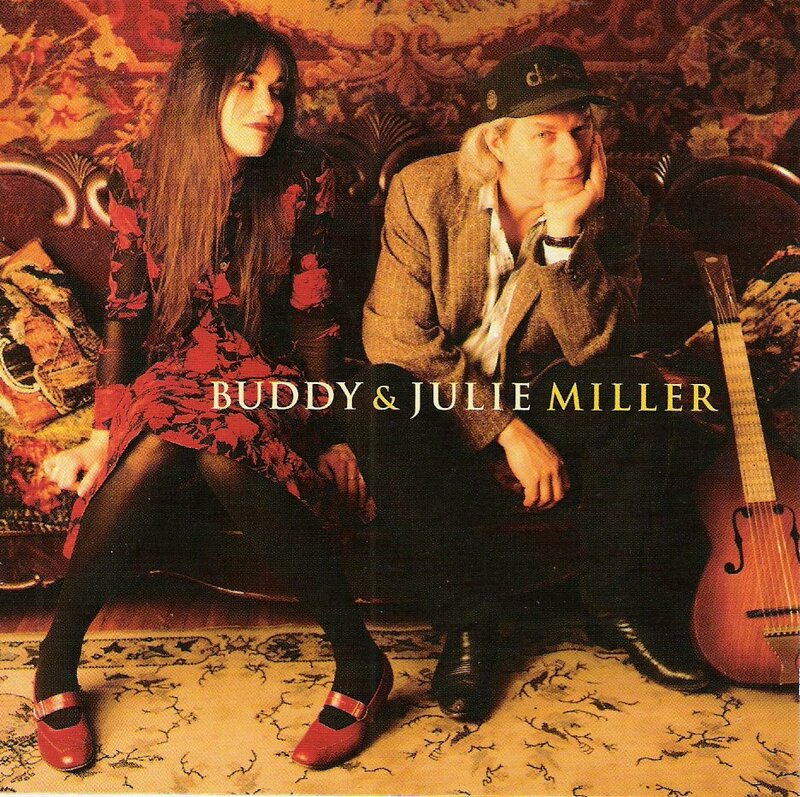 Julie Miller would be happy to introduce you, and does so on in a way on the website she and husband Buddy share, www.buddyandjulie.com. Toe and Mama are cats the Millers have been taking care of – "fostering," as Julie puts it – and they’re up for adoption to a good Nashville-area home. "Well, as far as Buddy’s concerned, they are," Julie says. "Me, I’m not so sure." The site is pretty low-tech by web standards, and the pictures of cats dressed to impress doesn’t betray the Millers as anything more than pet lovers, really. Until you scroll down a bit to see Buddy at work…on stage with Dave Matthews and Phish’s Trey Anastasio. Oh, by the way, the Millers are Nashville’s greatest musical couple. Thought you might like to know that. The dichotomy that forms Buddy & Julie Miller, recording artists, also rolls over into Buddy and Julie Miller, married couple. Buddy, intense songwriter and guitarist, is also dry and funny and clever. Julie, whimsical and gregarious, is also a strident and learned believer in a loving Creator. Together, as on 2001’s Buddy & Julie Miller album, or separately, on a slew of solo albums throughout the ’90s, the Millers’ musical partnership has survived and thrived, built mainly on the strength of their personal bond. That’s not to say they haven’t had their trying times, both serious and not so much, especially over the past year. Last February, the Millers got to live out a long-held dream, playing their own music at the Ryman Auditorium, opening for long-time friend Patty Griffin. But a technical snafu almost derailed the dream, as a downstage curtain caught fire and began smoldering, filling the auditorium with smoke. Julie, in what has to classify as one of the greatest quotes ever uttered from that stage, said, "That popping noise is making a burning smell." "We didn’t know what was on fire. We just knew people were leaving, and we hadn’t really had that reaction before," Julie says, beginning the laughter that would continue while telling the untimely part of the show most people don’t know about. "At the beginning of the set, I looked down while I was singing and thought in the back of my mind, ‘I didn’t know my skirt was this long, lah dee dah dee dum…’ And then I’m singing another serious verse, and then I thought, ‘My skirt isn’t this long.’ And I realized I’d forgotten to pin my skirt, and my skirt’s falling off!" The laughter comes in waves now. "This is just great, we get our big gig with Patty at the Ryman, and my skirt is falling off. So I try to stand with my feet apart like a big rock ‘n’ roll guitar player so my skirt doesn’t fall off," she says. "And I’m sure people are thinking, ‘Who does she think she is? Julie Miller, rock ‘n’ roll star…yeah!’ So I don’t remember anything but my skirt falling off and the place catching on fire." While that night is easy to look back on and laugh, the tragedy that struck Julie and her family the following September is still hard for her to talk about. For much of last year, Julie had been working on her next album, the follow-up to 1999’s Broken Things. Early in September, she found herself struggling to finish a song she was calling Underneath The Sky. "I had a notebook full of rewrites, and it’s not like it was just bad poetry or something, it just wasn’t getting done. I was searching for something, trying to find the ‘it’ to say what I was supposed to say," she notes. "I was in a conversation with Buddy, and I told him that all I could think about was life and death. I asked Buddy, ‘If I die, will you take care of my brother?’ And that’s when I really started to cry." Julie’s brother, Jeff Griffin, had been injured in a motorcycle accident at age 15, and had spent the next 23 years struggling to create a life for himself. On Sept. 11, 2003, a day before Jeff’s 38th birthday, it was a beautiful day in the country outside Waco, Texas, and Jeff decided to mow the lawn between the houses he and his mother lived in. Back in Nashville, Julie had been talking to a neighbor, asking about a house she was interested in having her brother come and live in. When she went back inside, the phone rang. "It was Buddy and he said, ‘Julie…’ and that was it. He was silent, and it scared me. Then he said, ‘Julie, Jeff’s been struck by lightning.’ That’s when you go into shock and nothing’s real. I asked, ‘How is he?’ and he said, ‘It doesn’t look good.’" The bolt struck Jeff while on a riding mower, in almost exactly the same spot where his accident occurred more than two decades ago. While such a tragedy can’t be anything but life-changing, Julie takes clear-headed comfort in knowing her brother is where he was meant to be. "In the last year, he found this cowboy church out there in the country, and it changed him so much. God just got him ready for heaven," she says. "It was like God was saying, ‘A lot of my children have to suffer so much on their way here, but Jeff, you’ve already done your suffering. We’re just gonna relocate your birthday party up here.’"
So Julie spent the balance of 2003 with family in Texas, not thinking too much about finishing the record. But with the new year a month and a half old, Julie Miller knows she needs to get back in the saddle, and she and Buddy’s upcoming show at Mercy Lounge should help her do just that. "I just want to give people and God as much realness as He can get out of me, kicking and screaming all the way. He invented everything that’s good and funny and beautiful and I just want to…" She pauses. "I just want to…I just want to ROCK!" The roiling laughter kicks in again. "The deepest, most profound think I can do is be a goofy little child running in circles, basically." And you know Julie Miller is going to be all right.